20-Year-Old Immigration Law Signed By President Clinton Continues to Harm Immigrants - Hacking Law Practice, LLC. 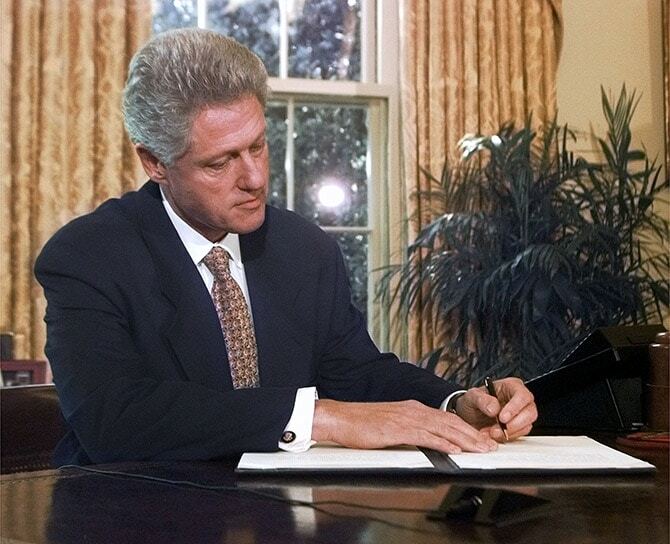 In 1996, Democratic President Bill Clinton signed the harshest immigration bill that this nation had seen in decades. The effects of this bill linger and hang over any efforts for “immigration reform.” En Español. Interestingly, Clinton’s Illegal Immigration Reform and Immigrant Responsibility Act has not been discussed much this election cycle, despite the fact that IIRIRA established the deportation machine that has been humming along for two decades now. Regular readers of this website know that we have been super-critical of Republican hard-liner Donald Trump and his harsh anti-immigrant, xenophobic presidential campaign. But this does not mean that Democrats get a pass here. The truth is that the “centrist” Bill Clinton signed the most draconian immigration bill of our lifetime. President Barack Obama has deported more people than any President in the nation’s history. Democratic candidate Hillary Clinton promises immigration reform, but what exactly would that reform look like? The ’96 law essentially invented immigration enforcement as we know it today — where deportation is a constant and plausible threat to millions of immigrants. It was a bundle of provisions with a single goal: to increase penalties on immigrants who had violated US law in some way (whether they were unauthorized immigrants who’d violated immigration law or legal immigrants who’d committed other crimes). IIRIRA greatly expanded the types of crimes that could result in the deportation of a foreign national. This included lawful permanent residents. And the Clinton bill made those changes retroactive, thereby boosting the number of possible (probable) deportations. The law also made many immigrants subject to mandatory detention while their immigration cases were being decided. This pre-trial hammer was used to make frustrated, imprisoned immigrants give up their effort to stop deportation and simply go home. An underfunded deportation judicial system only meant that these immigrants had to wait longer and longer while in lockup for their day in court. Immigrants convicted of certain crimes or those caught within 100 miles of the border were given summary deportation orders without ever having the chance to see an immigration judge. Finally, the 1996 law made it almost impossible for undocumented immigrants to receive cancellation of removal. This is a form of relief for longtime undocumented immigrants who had not committed crimes to stay in the country. IIRIRA made it almost impossible to obtain such relief. Proponents of immigration reform and immigration advocates are understandably appalled by the harsh rhetoric coming from the Republican party on this issue. But it cannot and should not be lost on any one who follows this issue that the Democrats have a lot of blame for our current situation as well.